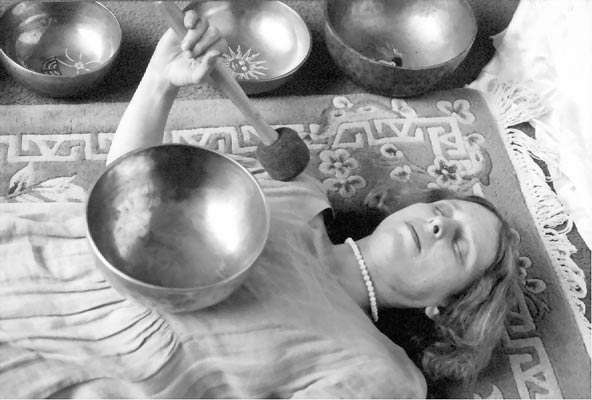 The most obvious effect of singing bowls is the deep relaxation they can produce. I have seen people going into as state of deep relaxation in only five or ten minutes. After a stressful day, I play my biggest bowl, and after half an hour I feel totally relaxed. A welcome healing tool in our modern times! For the best results, lie down in a comfortable position, and place the bowl on your chest. It is advisable to put an anti-slip mat (small rolls of it are available in hardware stores, an open mesh rubber matting usually for kitchen use) under the bowl, so it will not slide down. Take the striker in your hand and strike the bowl. It takes a little practice to strike the bowl at the right angle. You will notice that, because the bowl is so close to your ears now, that you can hear more of the lower sounds. Most important is that you can feel the physical vibration of the bowl going into your chest and from there spread to other parts of the body. Some people can even feel the vibrations go through their legs. The chest, being an air chamber, acts as a resonator, and the sound waves traveling through the body are a fine massage to all the cells and organs, plus the sounds picked up by the ears make the brain waves go into a relaxed state. Depending on the shape of your body you might want to raise up your head a little, otherwise the bowl the bowl might slide towards your face. You can always use a finger tip or two to control the position of the bowl to get it just right. Listen to the sound waves and their patterns, the lower and higher sounds and let yourself ride on an ocean of sound. It will make you so relaxed that after a while you may forget to strike the bowl again. Of course you can put the bowl on your belly, or even on your legs if you want to. Again, depending on how you are built you can lie face down and put the bowl on your upper back. It’s not as easy, but it can be so good for tension there.